This provides the background to the stage on which Vishal stepped, when he was appointed CEO in June 2014 (see post). Vishal was not only the first “outsider” but more importantly not part of the Founders' generation to take over the reins at Infosys. Being Indian, yet working in California with a strong product background from his time at SAP he ticked a lot of the boxes in order to return Infosys to its erstwhile glory as the beacon for innovation that Thomas Friedman had so eloquently and prominently described. Vishal’s strategy focused on aligning Infosys around automation and AI to re-emphasize the heritage in innovation and Design Thinking, but also to boost the balance sheet as the industry is going through the secular shift towards non-linear growth and outcome based offerings. This was underpinned by an influx of executives from SAP meant, in particular, to help drive the platform and product business. Undoubtedly, current clients will have questions about where this leaves them. Not only was the firm's latest CEO the driving force behind the firms shift to analytics, automation, and AI, but Vishal’s appointment also saw the CEO’s office take personal responsibility for key clients in a bid to strengthen relationships and develop and solidify revenues from current client engagements. 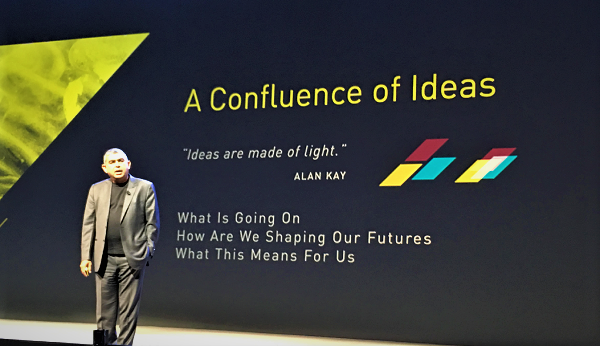 The whole corporate strategy will change dramatically, should the new incumbent come in with different ideas, and in the process likely shake and disrupt progress to solidify client relationships. Infosys has to reignite the sales and marketing engine and prove it has genuine distinctiveness when competing with the likes of Accenture, Cognizant, TCS, HCL and Wipro. Clients need to know what Infosys stands for, and why they should pay the top dollars to invest in this company, when there is so much intense competition making more impressive noises at present. While Vishal Sikka hit the ground running with a whole suite of ideas and innovations, these have largely dissipated over the past year amidst the public infighting. Without consistent financial performances, all the innovations will more or less evaporate and Infy will be left battling it out for low-margin transactional IT contracts. Infosys 4.0 (or whatever it ends up being called) needs a new dynamic CEO, it needs an aggressive sales leader, and a CMO that can articulate what the company is trying to do next and what it stands for. Merely parroting the insufferable fluff about digital and outcomes will not work - Infosys needs to lead India's innovation, not merely to make up the numbers. Phil great article which I shared on LinkedIn which also left me rather sad. Couldn't agree more Phil ...what is also important is to revisit the role of the Board ...as one of the participants questioned during the Conference Call today, shouldn't the Board step up and play an active role when all these issues have been 'fought' in public !! Agree Phil. My personal views : I am really surprised that someone of Dr.Sikka's stature decided to stay this long in such a hostile environment. Transformation of a company of Infy's size when the IT services industry is at this critical juncture requires a proven leader, a bold vision, a clear execution strategy and a strong team to deliver. He had all of them in place, but the friction with the founders caused unwanted media attention leading to the team to quit first, hurting the execution strategy and the vision became a distant dream very soon. Now its back to square 1 for Infosys - self-inflicted wound hurts us more than those caused by external forces. This is a sad day for Indian services - a CEO who's held up the financials well and driven so many ideas, getting publicly treated like this by the founder. I wish them luck now! True. Its just that its not a baby anymore. Its an adult who wants to be on his/her own ???????? Phil - begs the question as to what kind of a CEO will Infy now attract. All that this once great company will get is someone willing to 'bend the knee' to Murthy. Sikka brought in lots of SAP colleagues whose contributions vis-a-vis compensation is very questionable !! nevertheless, it is a sad that he has to leave midway of a 5 yr transformation..
Great article Phil I reckon his leaving was perspicacious. Infosys will suffer badly in the US in particular (and thereby the multi-national clients and prospects) because of the instability caused by the new immigration rules. Phil - Great article, thanks for sharing.. Many case studies serve to explain the obvious in retrospective; after a company has crashed and burned. Infosys has been stalwart member of respected outsourcing leaders. It will be interesting to see if and how they rise above what may be their perfect storm of growing pains, fear of letting go, and our contemporary social environment. All is ok. Sikka was a technology leader but also we should look at issues of corporate governance. NRN is a sucker for corporate governance. All issues he raised were for that. he never questioned deals of Skava or investement by 500 million fund. he singled out panaya and CFO/ general counsel severance because they were dicey. Thanks for this independent view, Phil. It couldn't be agreed more that Infosys has got themselves into a situation where the "Old Age School of Thought" is suppressing the "Fast Paced Digital School of Thought" with results which are going to be difficult for the entity and industry as a whole. Leadership transition and that too at the highest level is challenging which takes its own good time to settle. I believe the repercussions are not severe and we see the dust settling soon. Definitely sad to see Vishal leave. 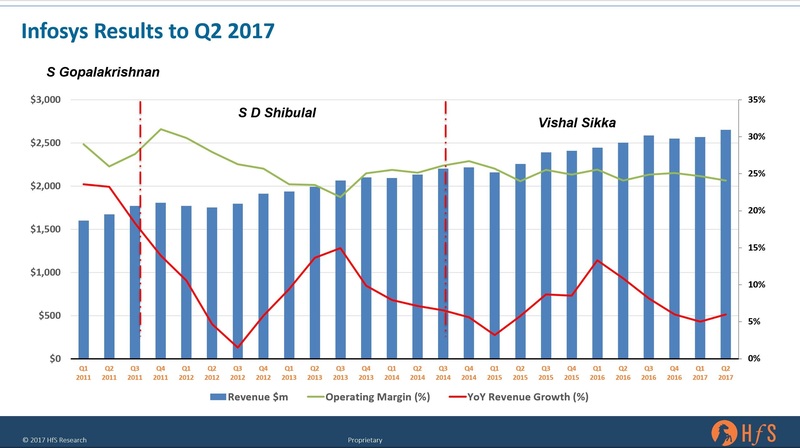 It will be a herculean task for Infosys going forward as (a) some of its stalwarts at the top have already left in the past 1-2 year (B) the change that Vishal was driving will now face a tough wall (c) the new CEO will have to drive it all over again winning the trust from employees, investors and board. ...A big task for sure and will take about 6 months or so to bring the bellwether back on track. All true Kamal. However, I think it will take about an year if it all they recover. the fact they are looking outside for a new leader + the issues between the founders and board is still open - most likely there will again be a shuffle in the board level before the CEO is brought in. Phil, I think you are bang-on with your assessment. Unfortunately so, not just for Infosys, but for the entire industry! The narrative is very clear. The industry is in throes of a significant disruption caused by automation. What made Infosys (and indeed the entire Indian IT industry) successful was an efficient supply chain of engineering graduates delivering significant value offshore to disrupt the erstwhile onsite-centric model. Now, there is this global socio-economic trend towards bringing back work in-country and in-house, at cheaper price points than offshore. The rules have changed. What got us till here will not get us there! Today, a technologist can deliver much better outcomes for the customers using a very small team of consultants, assisted by Ai-First technologies. The skills of managing a large workforce might be less relevant as we plunge into a new era, which is arguably more disruptive than the Internet! We need leaders who can put that technology to use. Infosys just lost one of them! Wonder if that is what helped Infosys achieve the results it delivered under Vishal. Having dealt with Infosys in the "field" for more than 17 years, have seen the atrophy (rigidity and ultra-conservatism) set in from around 2010 onwards and how Sikka's tenure brought a wind of change making them more responsive and agile to customer needs and in thinking. Despite all of Murthy's achievements and vision , he has faltered at a very critical juncture - his inability to let go his "baby" though grown up now , especially in a fast changing world - and it is a BIIIIG red flag for the future of Infosys. If he wants a puppet dancing to his tune (despite all the "corporate governance " related accusations which I believe were investigated and cleared) then all the capable and bright leaders will simply stay away. If he continues to behave this way, he is digging the grave for Infosys. It will not be an easy task for an outsider, to manage INFOSYS until NRN interferes in the functioning of the board. Few insiders Pravin Rao, Ranganath, Ravi Kumar or Mohit Joshi are best for this. Progress was being made at Infosys, but there are still a lot of Murthy-thinking partners there living in the past. Must overcome the non-strategic, outsourcing mentality.....it is still too dominant. @Tim - the whole Indian IT industry is suffering from this fear of change. The Indian mentality is very much to "keep the ship sailing if it is making money", and, let's face it, when you're still growing at 5% and making margins of 20-25%, why shake things up? I joke about the lovely sofas at the outside bar at the Leela Palace in Bangalore. I did not visit the hotel for 5 years, but when I did, the exact same cushions and sofas were still there! But let's not hold Infosys and leading Indian IT firms to the fire here - just look at the struggles the likes of Capgemini, IBM and DXC are enduring - and I assure you they are not growing 5% each year! Enough said. If there is a CEO who is needed at this hour, at Infy, it is Nandan Nilekani. He is the beacon that can shine some light in an otherwise a not so good situation. Well articulated Phil - as always! This one is going to be a case study for the corporate world - bringing new changes in the midst of legacy, corporate governance, founder created culture vs culture created by someone outside of the organization for the first time etc. Definitely a lot of learning..
Great synopsis Phil. Captures the current market challenge and change to new technologies are pushing tech firms to restratagise, wasn't the best time for Infy to lose Vishal. It is so typical - shows the inability of these companies to transform from Indian to Global Organization to their own detriment. The founders of the Indian outsourcing companies simply rode the wave of labor arbitrage for a couple of decades and now are rich and powerful. Vishal is an expat and most of all innovative/ creative, charismatic, high profile and not a sycophant (and what's more - not a south Indian :-))- hard on the ego of the founders and their minions inside the organization - frogs in a well trying to bring him down since they can never be like him. Murthy's son in senior role at Infy during his tenure was not a nepotism/ governance problem but now he is concerned with governance? Hypocrisy at its height. Such a sore loser. This is by far the finest piece anyone has written on the issue, backed up by real facts and independent insight. You are a credit to the analyst profession! Very well articulated views. Change is always tricky, however meddling around when you are not the top boss is not fair. Give some free hand and let it be more professional structure than personslity focused. Sounds like an idiom mash-up: out with the new, and in with the old. Good luck with that..
Two many misinterpretations in the press confusing the conclusions here. This is not about Murthy vs Sikka nor about Infosys shifting CEO & his client-facing team from West ( California) to East ( Bangalore), nor about Murthy/Pai/Founder team having a rethink on Infosys strategy over the past 3 years ( Sikka tenure). Murthy & the Founder team ( who still hold over 12% of Infosys stock & put in 30 years+ of their time & effort to build the company from scratch to $ 8 billion annual revenue), have always been conservative in spending. From 2001 onwards, Infosys has continued to build its cash reserves & now sits on over $ 5 billion of cash. Any of us who joined the management team at Infosys, always looked at the cash-chest & suggested acquisitions as a form of growth ( to meet/better our sales targets). The founders though had gone through a tough 20 year journey before they crossed their first annual sales of USD 100 million. They always favored organic growth over inorganic growth ( M&A based). One of the reasons was their own experience in the first 20 years & the other reason was the fact that Infosys kept adding too much headcount as it grew. The headcount growth each year meant a huge amount of cultural turbulence since India itself has so much cultural ( corporate/ linguistic/ ethnic etc) diversity. Adding cultural complexity by M&A, was an avoidable challenge. However, they were not completely closed to acquisitions. I did successfully get an approval for acquiring a European company in 2007. The key issue in this current Infosys issue relates to the acquisition of an Israeli firm, Panaya. Murthy does not have an issue with the quality of the Panaya asset. He received a whistle-blower letter informing him about a rushed up decision taken by the board to acquire Panaya, and the senior-most CFO level members of Infosys raising a red-flag on the Panaya acquisition in the board meeting. Both CFOs left the company within weeks of the acquisition getting approved & were given a significant golden handshake, never given earlier in Infosys's 30 year history. Murthy took this issue up with the board. The accused board members hired an external investigator & got themselves a clean-chit. The accused board-members did not share the full details with Murthy nor the other founders. Murthy is right in highlighting this as a " corporate governance" issue. There are currently two Chairmen of the Infosys board - Seshasayee & Ravi Venkatesan. Seshasayee is the main accused. He was the sole Chairman when the Panaya acquisition was approved by the board in a hurry. Seshasayee built his career in manufacturing trucks ( Ashok Leyland co.) in Bangalore & has little experience in managing a Global services company. Ravi Venkatesan on the other hand is ex-Microsoft & an experienced hand, later added to the board. This issue is easily resolved if Seshasayee resigned & let Ravi run the board. Instead, Sikka has been made the fall guy by Seshasayee. Ravi should put Sikka back as CEO, after Seshasayee resigns & he should open up the Panaya papers entirely to Murthy, as a Founder & significant shareholder. A join statement by Ravi & Murthy should then end the matter unless Sikka is found to have circumvented the due-diligence process in a rush to buy Panaya or he is found to have taken the decision to pay hush-money to the CFO. This is a question of ethics, not management strategy. @ratnesh - corporate governance played a huge role in all this, and Vishal's inexperience as a CEO was certainly notable in the early days. It is a curious situation. Every new team makes mistakes, a board that did not make too many independent decision in the past, a new CEO... why would you expect that there would be none (upto a point ofcourse..). Many large enterprises have skeletons and often these get buried by lawyers, the records get sealed for 99 years and so on... that is what lawyers are for. Does any of that require of the board to reveal all in public? Are there any regulators asking for all to be revealed? Has the new board followed all acceptable standards of dealing with a whistleblower complaint? If they have then what's the noise about? Is it ever going to abate? And many more questions arise further. Good corporate governance is a two way street. Should a significant stockholder focus on protecting value (and leave the governing bit to others tasked to do so) or should the stockholder worry about what got swept away, future value erosion if all be revealed (and why would it be revealed at all, especially since the majority stockholders are sitting out).And by the same so very high standards of corporate governance does it not seem like poor governance principle to first handover the keys to a new team, abdicate your responsibility and then come back and cry fowl? And not just that, virtually every senior management person was fired prior to the hiring, to clear the pitch for the new CEO. Was the erstwhile players helping to smoothen the path for a new team or covering their tracks before moving on? Very good points, Phil. The Chairman should normally step in & assist the CEO in many of these situations. Seshasayee, stepped into the boots of KV Kamath, when he took on a role of setting up BRICS ( China-India bank) bank. It was a sudden move where Sikka's board mentoring changed from an experienced banker to an experienced trucks/automobile manufacturer. Your 4th point on board members with international experience is important to note. Murthy himself had a good deal of international experience even before he set up Infosys. Subsequently, he had been head of bilateral trade councils ( India-UK etc) too, through out his career. But analyze Seshasayee's international experience. For eg. his one foray - a successful acquisition of a Czech Automobile company. Like most Hinduja Group & Mittal Group acquisitions, the modus operandi was the same - relocate the IP to India , fire the acquired headcount & cut costs drastically to get a quick ROI. Infosys board could certainly do with an injection of board members with more international experience, especially successful large M&A ( $ 1 billion+) track records. Ethnicity matters. Far too many NRIs ( Non Resident Indians) with US passports, fill up the board member positions. ( Indian Company Law mandates that at least 1 of the 15 ( maximum) board members must be an India resident & at least one woman should be a member too). NRIs appear to offer a best-of-both-worlds solution. Often they actually have no understanding of a diverse & young Indian workforce which forms the bulk of Infosys. An ethnically diverse, truly global board at Infosys, with a well defined understanding on the usage of the $ 5 billion cash reserve, with the founder members could do wonders for Infosys. Ratnesh - If wishes were horses....ofcourse one would wish for a global and diverse board. But the firm perhaps does not yet even have adequately diverse workforce or a diverse senior operating management. All roads lead to Bangalore or a Chennai or a NOIDA or Mumbai for most of the firms. And beating up the chairman only reflects more poorly on all who helped put him there and may even be biased. And whoever said that boards in the western economies are NOT close knit, risk averse, old boys clubs? The fear of the unknown or of people not like us pervades both society at large and businesses. It's all the same everywhere. than being a situation where the intention was dubious/motivation was for some benefit. Maybe it was just the rush to close the transaction and then one thing led to another. Look, it is all speculation. And what a CEO could have, would have, should have done is easy in hindsight. There is great reluctance among the old guard to accept: (a) what the move up the value chain entails in terms of compensation, accepting different working styles, making other necessary changes etc (b) that becoming a truly international company is an important step in order to move up the value chain. Like most Indian cos they are simply not setup either culturally or management wise to handle real multi-cultural setups & even moderately compex mergers or acquisitions. http://www.prganapathy.com/provocation-the-blog/nr-narayana-murthy-returns-to-infosys Much of what plagues the company today was analysed brilliantly by P.R.Ganapathy, NRN's former exec assistant some years ago in a blog post. Clearly the struggle to move up the value chain has been going on since NRN's time. PRG is rather polished about it, but you can sense the severity of the problem from his post. Incidentally when you commented "It took Vishal a couple of years to realize he would never turn Infy into a software company", what exactly do you mean? I'm heartened to see the news of Nandan rejoining as Chairman. I didn't get a chance to work with him directly, but met him later and also heard great things from sales, delivery and leadership. Seems like he has the undeniable charisma and intellect that Vishal could marshall, along with the grounding in ethical governance that NRN and the other founders were worried about losing. I think Infosys has to decide between sustaining old school established proven process and continuing the new school thought innovation started by Sikka. Nandan Nilekani is an icon of the Indian IT diaspora. He has led the world's largest Unique Identification implementation, which is an innovative and important milestone in India's digital implementation initiative in recent times. And he understands the pulse of Infosys as it has been part and parcel of his heart, soul, blood, sweat in conceiving, nurturing, birth, childhood, youth, maturity and leadership pathway to greatness. Vishal Sikka, with his extremely advanced thought process of bringing in artificial intelligence perspective to the Infosys board and his style of innovative brilliance. He brought his team from SAP and then they have faded into the sunset as the sun Sikka himself was set. So, if Murthy and Nilekani were its founding fathers, Sikka was the foundation of the pinnacle taking it from good to great. Unfortunately, the marriage did not last much. But Infosys being a strong foundation does not depend on individuals but from a process of imbibing the technology innovations brought in by Sikka team. Also, despite being cash rich, Infosys was averse to grow an inorganic growth. Infosys always has expanded from strength to strength organically with its well established knowledge management process imperative. Now, with the "new" Nilekani taking charge, I am sure he would take Infy to greater heights. With the trend of growing impetus of reducing outsourcing and replacement of backoffice human bodies with intelligent robotic process automation, Infy has to improvise and lead the new IT revolution by creating an artificial intelligence ecosystem that would be drawing inspiration and direction from the leadership and grow the new Infosys knowledge economy to greater heights.